Gracious Leadership Excited Me About Our Work! 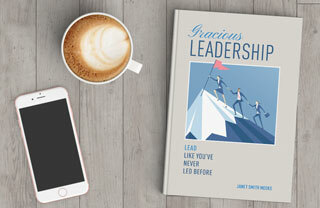 It has been several years since I read a healthcare leadership book that has excited me about our work as much as Janet Smith Meeks’ Gracious Leadership: Lead Like You’ve Never Led Before (Smart Business Books, 214 pages, $24.95). Out of the gate, Janet shares her personal, compelling story that motivated her career pivot from finance to healthcare. She advises leaders taking on new roles to slow down to speed up. She recognizes the trap many smart leaders fall into of jumping into rapid problem solving, believing they show the most competence by making a big difference fast. However, relationships matter and spending time to develop trust-based relationships through listening are the foundation for effectiveness. While the title Gracious Leadership may sound soft, Janet shares stories and tools that are quite the opposite. Instead it truly represents the intersection of ultimate respect and optimal outcomes. This leadership model is founded in the concept of respect for all, with an emphasis on listening with purpose and responding with care. She quotes SAS CEO James Goodnight who said,” Treat people like they make a difference and they will.” There is an emphasis on developing others, encouraging others, seeking feedback and remaining committed to continuous improvement of self. Gracious Leadership asks leaders to perceive every problem as an opportunity for asking the right, empowering questions that will help their team develop solutions and harness the passions of individuals to purpose. Chapters conclude with Conversation Starters for Your Team, lending itself as a leadership team’s tool for creating a shared vision and accountability plan. In this way, this good work may represent the next step in a healthcare organization’s journey toward excellence. Due to the great alignment with our executive member interests, ACHEMT is working to bring Janet Smith Meeks to Middle Tennessee for an upcoming program, so stay tuned.